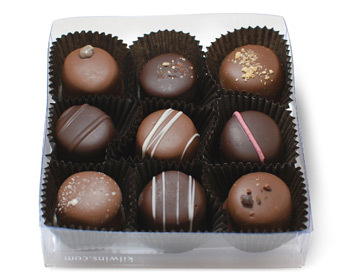 A 9 piece assortment of our signature Extraordinary EverydayTruffles! 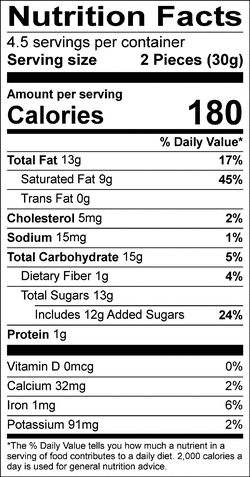 INGREDIENTS: milk chocolate (sugar, cocoa butter, milk, chocolate liquor, soy lecithin - an emulsifier, vanilla), dark chocolate (sugar, chocolate liquor processed with alkali, cocoa butter, milk fat, soy lecithin - an emulsifier, vanilla), coconut oil, white chocolate (sugar, cocoa butter, milk, soy lecithin - an emulsifier, salt, vanilla), roasted hazelnuts (hazelnuts, cottonseed oil), malt powder (extract of malted barley and wheat, sugar, milk, salt, baking soda), contains 0.5% or less roasted almonds (almonds, peanut oil, salt), raspberry, espresso beans, cocoa nibs, cocoa butter, vanilla, Irish cream extract (natural flavor, vegetable oil), sea salt, amaretto extract, almond extract (vegetable oil, natural and artificial flavor, soy lecithin [emulsifier]), champagne extract (natural flavor, soy lecithin [emulsifier]), natural flavor, maple extract (natural flavor, soy lecithin [emulsifier], vegetable oil), praline extract (natural flavor, caramel color, propylene glycol), cappuccino extract (natural flavor, soy lecithin [emulsifier]), raspberry extract (natural flavor, soy lecithin [emulsifier]), cashew, coconut, macadamia, pecan. CONTAINS ALMOND, CASHEW, COCONUT, HAZELNUT, MACADAMIA, MILK, PEANUT, PECAN, SOY, WHEAT. PROCESSED IN A FACILITY THAT ALSO PROCESSES: EGG.